I have taken the fear out of serving mushy brussels sprouts and created a Perfect Every Time Side dish adults and kids alike will love. Imagine glossy sprouts with a hint of garlic and oil that are tender inside with little salted chips to add a bit of crunch. Sprout chips are the leaves that fall off and deeply brown into crunchy bites, like little potato chips. 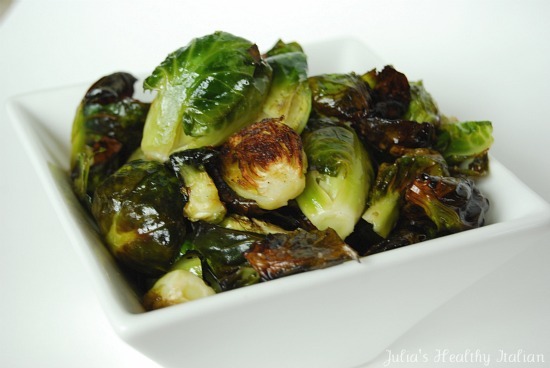 This quick and healthy side dish will forever change your thoughts about Brussels sprouts. My family loves this side dish. I probably make this close to once a week. I've even converted my no veggie eating nephew into a Brussels sprouts lover. With this recipe you will have perfectly cooked, scrumptious sprouts every time. Give this healthy Italian twist on brussels sprouts a try and you too will love them. In a casserole or baking pan combine all ingredients, mix with a spoon until sprouts are well coated. In a preheated oven, roast the sprouts at 450 degrees for 30 minutes, mixing them half way through. That's it! I made this over the weekend for the second time; my hubby and I love them. I was not a brussels sprouts fan for many years -- my only experience of them was steamed from frozen. When I started Weight Watchers last year, I roasted fresh brussels sprouts a few times and found that they weren't half bad. But this recipe is absolutely wonderful. I just wish I could convince my children to try them, maybe someday. I had them with your Balsamic Chicken, which my hubby grilled. It was a delicious dinner. Thank you so much. Your freezer bag chicken meals and your brussels sprouts will be regulars in our house for sure! Hi dani, I feel like I know you!! Thank you for your comments. Glad e chicken and Brussels sprouts went over well with the adults at least!! Try Brussels sprouts on a stick. I put 3 on a stick and my kids eat them. In fact I can put almost any food they don't really love on a stick and they'll eat it! Also try the melon baller. If there's a soft veg they won't eat or a fruit like melon they are not in the mood for, try giving them the baller. My kids love it and will eat anything they can ball!